Are you working hard to keep everything in your life BALANCED? I am sure, who does not want to lead a balanced life.. Staying balanced in the midst of your life is a true feat. A well balanced life is very much essential for personal effectiveness, peace of mind and living well. We all would like to maintain a balance between professional and personal life. Both are equally important to lead a successful, happy and healthier life. We need to have a right and well-balanced diet to be healthy and fit. Whether you are a new or an experienced investor, investing in balanced funds can be fruitful. They can give you Diversified Equity funds like Returns but with a lower risk profile. Last year in the month of June (2016), I had published an article on ‘ Best Balanced Mutual Fund Schemes ’. One year gone by, so let’s review the performance of these top performing balanced funds and let’s have a look at the new list. But, before that, let’s discuss on the basics of Balanced Funds. 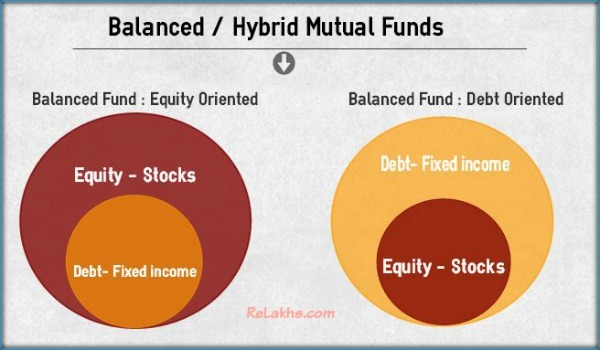 What are Balanced (or) Hybrid Mutual Funds? Mutual funds are broadly classified as either Equity or Debt,based on where the funds are invested. Equity funds primarily invest in stocks/shares. BALANCED FUNDS invest in both equity and debt instruments. What are different types of Balanced Funds? Balanced mutual funds can be Equity oriented or Debt oriented hybrid plans. If the average equity exposure of a balanced fund is more than 60% and the remaining 40% is in debt products then it is treated as an Equity Oriented Balanced Fund. This means major portion of the fund’s assets are invested in equity (stocks). If the average debt exposure is around 60% and equity is 40% then these funds are treated as Balanced funds – Debt oriented. (These proportions can vary among different balanced fund schemes). If you have invested in any of the above Funds, you may continue with your investments in them. There are around 61 Balanced (Equity oriented) Schemes. The Category’s average returns have been around 12% for the last 5 years. HDFC Balanced fund has been one of the best consistent performer under ‘Hybrid-Equity’ fund category. The fund’s last ten year record is as good as some of the best pure Equity funds. This fund generally allocates 70% of its corpus to Equities and the remaining balance is invested in Debt Securities. The fund’s investment strategy has been aggressive when it comes to allocation of corpus to mid/small stocks, when compared to its peers. This fund has a very low portfolio turnover (Portfolio turnover is a measure of how frequently assets within a fund are bought and sold by the managers). The last 5 and 10 year returns are 19% and 16% respectively. Birla Sunlife’s Balanced Fund (’95) is one of the oldest available balanced funds and has also been a consistent performer. This fund has an allocation of around 71% (May 2017) of its corpus to Equities and around 19% has been invested in Debt oriented securities. Around 23% of its Equity allocation has been invested in Banking & Financial Services sector. L&T Prudence Fund, though relatively a new entrant in this category, it has been performing really well for the last few years or so. It has beaten its benchmark and peers by impressive margins over the last four years. The Fund’s risk grade is ‘below average’ and return grade is ‘above average’. It has an allocation of around 69% to Equities. The fund’s investment strategy has been a ‘multi-cap’ approach with slightly higher allocation to Mid/small cap stocks. Whereas, it does not take much risk with Debt securities and primarily allocates debt corpus to less risky bets like Sovereign Debt, Bonds & Treasury investments. We need to see how this fund performs in a bear market (as this fund has been launched in 2011 only). ICICI Prudential Balanced Fund has an Equity allocation of around 65% and around 28% of its corpus is invested in Debt securities. Its performance during the last 5 year period has been quite impressive. SBI Magnum Balanced Fund has been inconsistent until 2011 (with patches of bad and good performances). However, this fund has been performing well since 2011-12. This fund typically maintains a 75-25 equity-debt mix. The equity part is multi-cap, with 50% allocation to Large cap stocks and 50% allocation to mid/small cap stocks. In the Debt portion, about 50% is invested in G-Secs. TATA Balanced fund has been one of the star performers under Balanced Funds category. However, its performance has not been up to the mark for the last 1-2 years. The fund’s three and five year returns have beaten its benchmark by around 10% and its category by 5% points. But the margin of out-performance has narrowed in the last 1 -2 years. Its standard deviation has been slowly inching higher. Nevertheless, it is still one of the best consistent performers for the last 10 years or so. Its 10 year returns have been around 14%, next best to HDFC Balanced fund. Two more balanced funds to watch out for are Franklin India Balanced Fund & DSP Blackrock Balanced Fund. Let’s keep a track of their performances. In case, you have to pick a balanced fund out of these top performing balanced funds as per your requirements, you need to give importance to both returns and measures of volatility. You may analyze various ratios as given in the above image and select the one which is the best for you. Ideally, the fund should have lower Standard Deviation, low Beta, high Alpha and so on.. Suggest you to kindly go through my article ‘how to pick right mutual fund scheme?‘ for the detailed explanation on various types of risk ratios. Diversification : The funds are invested in both equity and debt financial securities leading to diversification of investments. Low volatility : Balanced funds are less risky compared to pure Equity funds. Equity portion will provide the capital appreciation through stock prices appreciation and dividend income. Whereas, Debt portion can provide stability through interest income and appreciation in Bond prices. You can consider balanced funds for your medium to long-term goals like Retirement Planning or for Kid’s Higher Education goal planning. Have you invested in any of the balanced mutual fund schemes? Do you believe that one should include a balanced fund in his/her long term MF portfolio? Kindly share your views. Cheers! i had invested in the erstwhile HDFC Prudence growth and dividend too. It had given me good returns for the last two years. After the midcap collapse, dividend tax and merger i am not very sure of the perfomance of the new avtar of this MF. Now its known as HDFC balanced advantage fund. i could see too many negatives. The AUM has reduced to 1500 Cr and the fundmanager has changed. If you would like to stay invested in a typical balanced fund, you may get out of it and move to HDFC Hybrid Equity Fund (HDFC Balanced fund). If one your investment objectives is ‘capital protection’ then it is advisable not to invest in Mutual Funds especially Equity oriented ones. This article cleared all my doubts regarding Balanced Mutual Funds. It has been really very helpful. Thank you. Wanted to know as to where do i invest 1 lac lumpsum (recd. as security deposit towards lease of apt.) considering the fact that i would need to return the same if the lease not continued post 11 mths. Dear Roy.. You may consider investing it in a Liquid Mutual Fund. I have been following your articles for over a year now and must thank you for the valuable advise to the readers of your informative blogs. I am 40 years old and for last almost one year investing 5K each thru SIPs in Hdfc balanced, ICICI focused bluechip, SBI Multicap, icici value discovery and hdfc midcap opp. funds for different financial goals. I have received a lumpsum amount as bonus and also one of the bank FD has matured recently, totaling to about 12 Lacs. Could you please advise where to invest this sum for a medium term horizon of 4-6 years? You may invest this amount through STP route in HDFC balanced fund and ICICI Bluechip fund. You can pick Liquid funds from respective fund houses, invest the lump sum amount in them and set up STPs to equity funds. HDFC Liquid fund -> HDFC Balanced fund. And for how many months STP should be set for this amount? And for both the funds the date of STP should be same or different? Somehow, I sense that this year the equity markets can be very volatile till the time of next General elections. You may follow two strategies, one -> STP approach and second -> Invest manually the additional lump sum amounts in your portfolio of existing funds. You may set up STPs for 12 months or so. Wonderful presentation thanks for the details.. I am planning to invest another 8k in SIP- please suggest me something which will give good return in next 5 year time. Also suggest me if I can take Franklin Funds out and invest in somewhere else or continue with those. I am currently 36 year old. Dear deepak ..You may continue with these funds and can invest additional sums in these funds itself.. The markets are correcting so is it the right time to top up balanced funds or Large cap or mid cap. Each of them has corrected in the increasing order. Balanced fund the least and small cap the most. What would you advise? If one has a very long term investment time-frame, can surely make additional investments in Mid/Small or diversified equity funds. Personally, I investing additional sums in a small cap fund and in an ELSS fund for my long term goal+tax saving. I want to invest in ultra short term ,funds and small cap funds ,my time horizon for small cap will be 5 yrs ,’which ultra short term fund will best to invest now ,whether Franklin india UST -superinstitutional fund and L and T floating rate fund will be ok to invest or suggest the UST Fund ,to invest in current sceneario , Can we invest in small cap fund at this time ,Thinking to invest in L and T emerging buisness fund? is it right move. to invest. Kindly suggest. You may go ahead with the mentioned Franklin fund. Suggest you to stay invested for long term (more than 5 years) in case you choose to invest in a Small cap fund. L&T emerging businesss fund is a decent bet (has allocation of around 42% to small cap stocks ). Franklin Smaller Cos fund (allocation of around 43% to small cap stocks). SBI Small & Mid cap fund (allocation of around 64% to small cap stocks). For eg: unit price of ICICI Prud balanced fund last two days before is 140.04 ,but even though correction happened in its price today ,its units price selling at 141.130 compartively lesser than yesterday 141.135 but higher than previous day. It is next to impossible to predict the market movements and to TIME the markets. In case, one has near term goals and have been investing in Equities adequately, he/she can re-balance the portfolio (can book some profits and invest in safer bets). If one is investing for long-term goals, suggest to continue with the investments. In case, markets correct a bit, consider it as an opportunity to invest more (if possible). I’m a regular follower of your blog, and appreciate your work. For a long term portfolio, i prefer SIP and threshold re balancing. When market is undervalued i buy more units, but what should i do when market is over valued? Personally, I do not re-balance my portfolio for my long-term goals. For ex: If have say 10+ year time-frame from now, let us invest as much as possible in Equity oriented funds and give them the time to grow. In case your target goals are say within 5 years from now, may be you can start re-balancing the portfolio. You may consider Equity oriented balanced funds or Equity savings funds. Do note that units allotted under each SIP (of ELSS tax saving fund) are locked for 3 years. I don’t need money in near future. So its for long term only. But its not giving me high returns so I was thinking may be I can stop SIP for both (or for any one) and invest in some other funds. ya 3 years are over so locking period for ELSS is already over. Not sure should I continue or look for some other funds. You may discontinue with Tax saver fund and opt for other ELSS fund (if tax saving is one of your objectives) like Franklin Taxshield / Birla Tax relief 96. If ELSS is not your choice, you may pick a mid-cap fund for long term. I have been following your blog from a long time, thanks for sharing this less known information. I have started some of the investments recently only. I am 30 years old married man please review my portpholio all plans are direct taken from my cams online . Also, Please suggest should I switch one time investments to other existing SIPs. I some short term and some long term goals so which SIPs should be taken for respective goals. Could you kindly define your investment time-frames? The listed funds are good ones. Do note that sector specific funds have very high risk-profile. None of these funds may not be suitable for short term goals. 1. I have some very short term goals 3 to 4 years. (Home purchase), I am saving amount for that too other than SIPs, but I will need some SIPs amount (from where I should take 3-4 lakhs ). 4. For retirement – I am thinking EPF+ EPS+NPS will be sufficient (should be around 25 lakhs and pension of 10k \ month). # ICIC Prud Bank –to-> IDFC infrastructure fund. # ABSL small & mid cap –to-> ABSL tax reliefe 96.
and will stop the ICICI and ABSL small & mid cap funds. Please suggest if I am thinking is correct. 2. After time (6 month or 1 year) am thinking to take a balanced fund (HDFC Balanced fund) so should I take that or do a top up on existing funds(if yes which one I should choose). 1 – You may consider Short term debt funds or conservative MIP funds for short term accumulation (Home purchase). 2 & 3 – Your existing portfolio can be fine. Yes, you can add one Balanced fund in place of multiple allocations to mid/small cap funds. You may totally avoid investing in Infra fund, as most of the regular funds do have allocations to Infra based stocks. What is 200 Day moving average? Myself Siva .I have been investing in MF from 2.5 years .my portfolio is as below . I would like to invest 15000 rupees /month more so please suggest if i have to add new MF or can I increase SIP in existing funds.Also let me know if my portfolio is good as I am looking for long-term (15 years) and want to accumulate 4 crore by that time. iam 36 year old now.i have term insurance for 2 cr . Health insurance covered by employer apart from that i have health insurance for 25 lakhs/ year. I have a kind of investment (some thing like ppf) in company of around 45 lakhs and it will keep increasing by 6.5 lakhs per year . This money is actually invested in company stocks. After paying all emi’s (for flat and plots) iam still left with 2 lakhs per month of savings .i have a bank balance of 5 lakhs as emergency fund . My father is 72 year old .he is exservicemen.all medical expenses for him are covered by government. This is my present situation . I have 5 year old daughter and 3 year old son .my goql is to create wealth for thwir education (graduation or similar).so i can invest for a time frame of 15 years . Your MF portfolio looks fine to me.You may make additional investments in existing funds itself. How to pick right mutual funds? I am planning my finances for 2018 and once again need your advice and expertise on doing so. Specifically, I am looking at investing an additional 12000 per month in Mutual Funds through SIPs for 8-10 year period towards wealth generation goals. Please also advise in case any reshuffle is needed in existing SIP holdings. Also, I would request you to please advise in case my coverage on insurance fronts is OK. I have always valued and 100% trusted your advice and am once again reaching out for your immense expertise. Family: Myself (35), Wife(32), Dependent Mother(68). Income: Myself- INR 125000 PM. Wife- INR 100000 PM.Wife also gets VPF deducted equal to PF. Fixed Expenses- House Rent+Maintenance- 32000 PM, Car EMI- 11000 PM, PPF- 1000 PM, SIP- 38000 PM. 1. Organization Life Covers from both mine and wife’s organization worth 1Cr each. 1 – Locked savings of Rs 10 Lakh – Is this part of your Contingency planning? 2 – Is your mother covered under Company’s health insurance plan? 3 – You currently own investments in multiple funds from same fund categories like two balanced funds, two large cap funds, two ELSS funds..
You may discontinue ICICI LTE elss fund and continue with Franklin Taxshield. You may discontinue your investments in TATA balanced fund. SBI bluechip and ICICI Focused – both are decent funds. You may check their portfolios overlap. Kindly continue with ICICI Value discovery fund. SBI mid-cap has been an average performer in mid/small fund category. 1. 10Lakhs- is towards possible downpayment contribution to my brother’s flat purchase next year. 2. Yes, mother is covered in company’s health plan. 3. Thanks for advice- ICICI LTE is wife’s tax saver and Franklin is mine. Should she continue or switch to Franklin? I will discontinue TATA Balanced fund. So I have 5000 from Tata balanced fund, plus an additional 12000 per month which I wish to invest. What would be the ideal option to invest this 18000 per month? Once again, thanks for all the help and guidance. Kindly go through my article on ‘ Best ELSS funds‘. You may make additional investments in your existing funds itself. If you can afford to take risk, can add one more Mid/small cap fund. For ex : HDFC Mid-cap / Mirae Emerging bluechip etc. I AM 48 YRS. OLD AND WOULD LIKE TO INVEST IN HDFC RETIREMENT SAVINGS FUND & TATA RETIREMENT SAVINGS FUND- MODERATE PLAN THROUGH SIP TO GET A CORPUS FUND OF A LUMP SUM AMT. AT THE AGE OF 60. NOW, I NEED YOUR VALUABLE SUGGESTIONS. THANKING YOU AND LOOKING FOR YOUR BRIGHT FUTURE & PROSPECT. PL. GO AHEAD AND KEEP IT UP. You may kindly go through my review of HDFC retirement fund, can be useful to you. Kindly check with them on what basis they have suggested these funds?? May I know your investment objectives and time-frame?? 1.What is total exposure of that asset class. 2.What is risk adjusted return earned in the funds, expense ratio etc. 1.What is the investment category and the grading for the securities which the fund manager is handling. Investment objective is wealth creation. Time frame could be 5-15 yrs. 1. Lumpsum of several lakhs in a comparatively safer area. 3-5 yrs. Return expected 8-12%. Should this be debt funds or Dynamic Asset Allocation Funds or any other? 2. SIPs in equity that I discussed above. If your time-frame is more than 10 years, why are they looking at Medium/short term debt funds. I too believe that their selection funds is not up to the mark. 1 – If you are expecting returns of 10+, you need to take risk. May be you can consider investing in aggressive MIP funds with a time-frame of around 5 years. Kindly read : What MIP mutual funds? 2 – For long-term goals, you may pick one diversified equity fund, one mid-cap fund and one balanced fund. Let’s not try TIMING the markets.. If your time frame is around 5 years and objective is ‘wealth accumulation’. You can invest the lump sum corpus in Liquid funds and then set up STPs (Systematic transfer plans) from liquid funds to respective Equity funds. You may consider couple of Balanced funds. Mr.Sreekanth, I used to have around 47 lakhs all invested in ICICI Prudential Balanced Fund – Monthly Dividend since May’2017. Then it was Crisil rating Rank 1, after 2 months or so it dropped to Rank 2, and now it dropped to Rank 3. Received dividends for the past 6 months. NAV was high last week, So I redeemed and and did an profit booking and made up around 20% in returns after paying 1% exit load & 15% short term profit gain tax. You may first kindly let me know – your investment objective & investment time-frame?? No particular time frame bounded. I can wait 1 to 5 years, where ever there is good safe returns. Dear Vik..Is accumulation of corpus or regular income (dividend), which is your investment objective? If your objective is to accumulate corpus in around 5 years time-frame..You may again invest in balanced fund. I believe that ICICI Pru balanced fund is a decent one, kindly do not churn your portfolio on short term performances. Invesetment objective. I already have other sourcces of income on regular monthly basis. I do not mind investing on Balanced Fund once again. Can you advice any good balanced funds? or any other funds you might feel suitable for my Invesetment objective. The main reason I pulled out from ICICI pru Balanced Fund Monthly Dividend was not just short term gain, but the Ranking from 1 to 2 then to 3. So I had to be alert and careful with my corpus. Kindly note that star ratings/rankings are done on short term performances only, giving too much importance to star ratings may not be advisable. noted with thanks. Yesterday I have invested in L&T Emerging Businesses Fund – Regular Plan (G) >> 20 lakhs. Can you advice any others for my remaining 27 lakhs? Dear Vik..As suggested earlier, you may pick a balanced fund, may be HDFC balanced fund. Kindly be aware of the risks associated with Small cap funds, considering the fact that your time-frame is around 5 years. I am selecting right fund to invest for long term 10-15 years. Please suggest me ! 1,2,3 & 4 funds can be considered as Multi-cap funds. Suggest you to kindly check the portfolios overlap %s among these funds. Kindly read : MF portfolio overlap analysis tools! However, all the listed funds are decent ones. Your blogs are really helpful and informative.Crisp and precise content. Keep sharing your thoughts. 1) Currently I have shortlisted below funds. We can category Birla MIP fund as an hybrid fund (not completely a debt category). Kindly read : MIP funds – review. You may allocate some amount to diversified equity fund as well. 3 – I have always believed that when i am investing in an actively managed equity scheme, the AUM size should not be a factor to invest and my fund manager should have the capability to handle such AUMs. which debt fund should be chosen for a lump-sum investment of 5 Lacs for starting an STP in Hdfc /ICICI balanced fund? You may consider liquid funds. I have invested 2.5 L in hdfc liquid fund and started STP to hdfc balance fund. For balance 2.5L, i was thinking of parking 2.5L in hdfc medium terms opp. fund and buying hdfc balanced fund only on Dips. Have chosen this debt fund as the returns are better than liquid fund. Therefore just in case, the amount remains invested, the returns would be slightly better. Thought of this as the markets are on very high levels and there could be a correction in the short term. Kindly note that Debt funds too have some risks associated with them. Do you plan to redeem some units of debt fund and invest in Balanced fund whenever such opportunity comes?? That’s what I plan otherwise will just remain invested. In Jan’15. I had invested 1.5 Lacs in lumpsum in ICICI Pru Equity Income Fund – Growth. This is a balanced fund which was lunched in Nov-2014. After nearly 3 years of launch, if i look at its performance, it stands out among the laggards with just 9% annual return. Whereas, all goods funds in balanced category have given a return of over 15% and some of them even 25% also! What could be the reason for such dismal performance from a reputed fund house ..and what would be your advise for me? Should i hold this fund or switch over to a better one? Investment horizon is another minimum 5 years. thanks…and looking forward to your suggestion. There is no guarenteed that all schemes will perform well. Each scheme has its own investment objective and strategy. Sometimes it works and sometimes it may not. Also, different funds are managed by different fund managers. Do note that its advisable to stick to schemes with long-track records, which have performed consistently well across different market cycles. ICICI Equity income fund belongs to Equity oriented balanced funds, this is relatively new fund. Given a choice, I would pick a consistent performer like HDFC balanced fund than a new fund. You may switch to HDFC Balanced fund. pls suggest any more mutual fund should be added or modify existing funds. can u suggest any other instruments to be added in my portfolio. For a 5 year investment horizon, equity oriented balanced funds can be an ideal choice. Except IDFC fund, the other three funds are fine. Hi, thank you for guiding us. My query is wrt to the taking additional advantage over ‘just parking money in maxgain home account (to get 8.7 % interest)’. I plat to invest this 18K in 2 or 3 funds (at leat 5 years), 10k in balanced rest 8k in multicap or as you suggested. please suggest me good funds. Please suggest me the right funds may be from existing or new funds. I hope your suggestions will help me to repay my home loan. You may pick couple of Balanced funds Ex : HDFC Balanced fund / Birla Balanced ’95 fund. I am a new entrant to Mutual fund investments planning to invest in medium & long term. With the P/E ratio approximately at 26, is it right time for me to invest in SIPs (or) should I wait for it to reduce? In general what does P/E ratio signify? It is calculated by dividing the current market price of the stock by its earning per share (EPS). PE ratio can be calculated for a stock as well as say for an Index. I assume you are referring to index EP at 26. So, how to calculate this PE? For ex : Nifty PE ratio measures the average PE ratio of the Nifty 50 companies covered by the Nifty Index. If you are investing for long term and that too through a SIP (regular intervals), you may start investing and do not wait to TIME the markets! Thanks for the clarification, Sreekanth!! Currently working in state govt . 1k hdfc mid cap fund for wealth creation . 10K per month in RD for emergency fund . Sir i want u to review my investment profile . You may kindly continue with your investments in these funds. Once you accumulate the required emergency fund, you may divert the savings to mutual funds (instead of RD). Do you have health insurance cover? Is your term plan covers permanent Disability risk? Sir my term plan is hdfc click to protect plus (life option ). Should i take personal accident insurance separetly . Dear Abhishek ..Yes, it is advisable..you may kindly go through the suggested article..
my spouse and I are in secured job. we are investing Rs 51000 in following SIPs. My horizon is 12+ years, aim is wealth creation with moderate to aggressive. In addition we have compulsory NPS (Rs 14000 each per month) and also invest in PPF of atleast 50k per annum each. All the above listed funds are good ones. Only thing is may be, too many funds in your Equity fund portfolio. Hi Sreekanth, As you mentioned in other invest lumpsum when the market is relatively low, So, Do you recommend investing lumpsum amount in midcap or small cap mutual funds in current market situation or should i wait for some more time. I have a 1lakh in hand which i am planning to invest. I don’t have any urgency. I am looking for long term 10 years. What is the best mode i can go for? You may set-up STP (systematic transfer plan) and move the lump sum amount from a liquid fund to equity oriented funds. I have around 2 Lakhs to invest for a period of 1 year. Around 50000 i would like to invest in some aggressive investment options which can give me very high returns. Please suggest me some good funds for each category. If you have any other suggestion for investing this amount for a period of 6months to 1 year please suggest that too. (For around 75% amount i’m ready to take moderate risk and remaining 25% can take high risk). Investment option for 15 days???? I meant , if i want to withdraw the amount from these investments (without completing its tenure) then i can wait for 1 to 15 days to get it redeemed to my account . Kindly note that we can’t expect very high returns from debt funds and that with an investment time-frame of around 1 year. Kindly go through earlier suggested articles. You may consider Liquid funds, Ultra short term debt funds / arbitrage funds. I am having a bank FD of Rs. Nine Lakh earning 8% annual interest for a duration of 6 years. Interest income of Rs 6,000 comes to me monthly I come in 30 %tax bracket. May I know if monthly/periodic withdrawal is your requirement or you just want to withdraw certain amount from equity fund?? If fixed period income is your requirement, considering your tax bracket, and if you can afford to take moderate risk – Setting up SWP from a Balanced fund is effective and makes sense. Time-frame of 6 years is fine. However, there is no guaranteed that capital erosion will not happen, as returns from MFs are not fixed. Thanks Sreekanth for your valuable guidance. I am thinking of foreclosing my bank FD and investing Rs 9 Lakh in Balanced fund with SWP of Rs 6750 every month. My time horizon of holding the fund is above 6 years. Dear Vinod..Given a choice, I will consider HDFC balanced fund. Kindly read : How to pick right mutual fund scheme? I have made one portfolio for my Mother too !! Dear Bharat ..Looks fine..Kindly check their portfolios overlap %s..
Time horizon is more than 15 years. 1. Axis Long term Equity Fund – Growth/Direct – 5000/month. 2. Mirae Asset Emerging Bluechip Fund – Growth/Direct Plan – 5000/month. 3.ICICI Prudential Value Discovery Fund – Growth/Direct Plan – 4000/month. 2 & 3 are fine. Axis LTE is it for your tax saving too? No, Axis LTE is not for tax savings. Sec 80(C) is already crossing without mutual funds. Please comment on Axis LTE . I also request you to recommend me 1 additional fund(apart from the above mentioned three funds) for Rs.5000/month SIP. If so, instead of Axis fund you may add one more diversified equity fund or a mid-cap fund. Ex: Franklin High growth companies fund or HDFC Mid-cap opp. And one equity oriented balanced fund to your portfolio. 1. Motilal Oswal Focused Multicap 35 Fund-G/D – 5000/month. 2. ICICI Prudential Value Discovery Fund-G/D- 5000/month. 3. Mirae Asset Emerging BlueChip-G/D – 5000/month. 4. Franklin India Prima Fund-G/D- 5000/month. 5. DSP Black Rock Micro-Cap Fund-G/D- 5000/month. I have an unavoidable debt related investments of 13K/month(PPF etc). I request you to kindly re-assess and recommend any modifications in the above mentioned plan-A for 25K/month in pure equity funds. Separately, I also request you to remove any one of the above funds for a Plan B for 20k/Month. All the listed funds are good ones. The new investments in DSP micro cap fund have been temporarily suspended. Alternatively, you may consider Franklin Smaller cos fund. You may add one equity oriented balanced fund instead of small cap or one mid-cap fund. Thanks for giving these helpful details, I have prepared a folio for long horizon (5+years), can u please suggest t if this is fine. I am planning for HDFC balanced fund to add in folio with Rs 4000. Is this correct decision? If any changes are required please suggest. Thanks for your help. You may drop UTI mid-cap fund. So should i need to go with only 3 funds in portfolio as suggested and remaining (UTI Mid cap + ICICI Prudential Top 100 + ICICI Prudential Mid Cap + HDFC Mid-Cap Opportunities) need to stop. If Need to stop then can i leave money in them or should redeem. I have assumed that you are yet to invest in these schemes..
No Sir, i have already invested in these except HDFC Balanced Fund. Since you have time-frame of around 5 years, suggest you to retain only one mid-cap fund (preferably HDFC mid-cap) and may allocate higher amount to Large cap & balanced funds. So if i need to continue other invested mid cap funds then tenure should be 10+ years? I have very less capital of Rs. 80k which i want to invest in Mutual fund for short term goal i.e 1 year and don’t go through the Bank since interest rates are very low in bank..
Pl advice some MF’S name as well as category so that i can earn better monetary benefit compare to Bank. If you are aware of the risks associated with debt funds (if you can afford to take some risk), you may consider Short term debt fund and/or Arbitrage fund. Ex : Franklin Low duration fund / ICICI Equity arbitrage fund. You may pick either of the first two a) or b) under large-cap category, as these fund’s portfolios overlap by around 45%. How to check mutual fund schemes’ portfolio overlap? What are the different types of fund categories? You may go ahead with the other investments! Appreciate your long term investment strategy.. I believe that you can trim your portfolio a bit. You may kindly check the portfolio overlap among the funds (except the Gold fund). You may replace ICICI Div yield fund with any good Mid-cap fund. Instead of Reliance opp fund you may add one balanced fund to your portfolio. I have been investing 6k per in Mutual fund since last 1.5 years, My portfolio and goal is as below. My Current Age is 30 years and i am having on LIC policy with SA of 2 Lakh (Jeevan Anand) & looking for Term Insurance. DSP Black Rock Micor Cap Fund—– 10 years to get benefit for child education current age is 6 years old. ICICI Value Discovery Fund—-5 years for planning to purchase Motor Car upto the value of 4 Lakh. I have been working in an insurance industry and earning 25k per month & getting Health insurance from my employer. Should i continue with my above goal or need to do some changes. You may consider investing in an equity oriented balanced fund instead of multi-cap fund for your 5 year goal. Kindly do understand that sector/thematic oriented funds have high risks, you may consider replacing Manufacturing fund with a good Mid-cap fund instead. Once you buy a term plan, you may discontinue the existing life insurance policy. Thanks for providing such an important information regarding wealth creation. Should i discontinue with my existing two MF’S and replace with another. 2) DSP Black Rock Micro Cap Fund replace with Franklin India Smaller Cap Fund. Rest two funds- Axis Long Term Equity Fund & ICICI Value Discovery fund looks fine. If you have existing SIPs in DSP Micro cap fund, you may continue with it. I am already having Multi cap fund- Icici Value discover in my portfolio, if i’ll choose Franklin Prima fund , there may be chance of Overlapping. Should i invest in Large Cap fund like Birla Frontline equity or Icici pru focus Bluchip fund etc. Kindly note that Franklin Prima is a mid-cap oriented fund, whereas Franklin Primaplus is a multi-cap one. Finally i have decided my MF portfolio which is below. I am looking for another SIP under Large Cap category for investing 1,000/- per month. You may pick – Birla Frontline equity / SBI Bluechip fund. Should i switch my existing Birla Sunlife Manufacturing Equity fund & utilized 2700 units against Birla Frontline equity. Yes, you may consider it. But kindly do note that SWITCH is also considered as normal redemption, so watch for any Exit load / tax implications (if any).. I seek your guidance on how often and how to check whether my MF portfolio needs any reshuffling? Also, in case I do realize there is need to shuffle, how do I go about it- as in how can I move from one fund to another without losing on the benefit of staying invested for long periods? Ideally, you may review your portfolio’s performance once in 6 months, but reshuffling only if it is required may be say in 2 years or more than that. Personally, once I invest in a consistent performer (MF Scheme), I stick to my conviction and give it a sufficient time (for example I am with UIT midcap for the last few years, though it has been not performing well for the last 1 year) before making a switch. If switching is required, you may to have redeem the units and re-invest in the newly selected scheme, do watch out for tax and/or exit load implications (if any). Very nice article, I wanted to invest in Balanced fund since long now I can start investing in this category. However, below is my current portfolio as SIP. 1. Axis Long term Equity (ELSS – 5 years Loc-in) – 2000 RS. 2. Mirae Asset Emerging bluechip (Mid-Cap) – 2000 RS. I am planning to invest in two more fund category mentioned below, kindly suggest if adding below category funds will be good for my portfolio interms of fund allocation and diversification and how much amount of SIP to be considered for below ? All the listed finds are good ones. You may pick 2-3 funds (Large/Multi/Balanced categories) and plan your investments. What is large/Mid/Small/Multicap fund category? Thanks for your suggestion, I have one doubt about SIP Amount. SIP amount should be kept same for all the categories or it has to be different for different category funds to diversify the investment. For example, If I have SIP of RS. 2000 in Mid Cap then do I need to SIP of more than RS. 2000 in Large/Multi or Balanced Fund to balance or diversify the investment. What do you suggest would be the ideal scenario. As you have long investment horizon, you may allocate higher amount to diversified and mid-cap funds. Hi Srikanth!! I have below funds as part of my portfolio. I want to invest Rs. 2000 more in SIP. Please let me know if I should choose L&T India Value Fund-Growth ( Mid cap) or any balanced fund from the list in your article. My investment horizon is long 10-15 years and my current SIP is Rs. 10000 / month. Thanks!! I believe that there are better consistent performers under ‘Multi-cap’ fund category than Axis 25 fund. You may add one Mid cap fund to your portfolio (or) consider increasing your allocation to Mutli-cap fund. Also for my short/medium term horizon, I will be investing in Birla Sun Life Monthly Income Plan II Wealth 25 Plan-Growth. Please suggest if this looks ok to you. Can you define your short-term horizon? In case if your short term timeframe is less than 2-3 years, advisable not to consider Birla MIP fund. Read : Best MIP Funds.. Thank you so much Sreekanth for your suggestions!! Hi! i am looking for assistance in building up my investment portfolio. As of now, I am investing 5k in DSP tax saver. I have about 5-7k per month to invest for tax saving. Apart from tax saving i am considering investing in diversified equity or balanced. DSP tax save-a large cap ELSS, I am thinking of investing in mid or multi-cap elss. It would be favorable if you list some.I am interested in tax saving and investment, more of investment. I have thought of carrying investment for 5-6-7yrs time frame. Thanks. You may consider Birla Sun life ELSS funds. Kindly read : Best ELSS funds.. But, do kindly note that funds’ portfolios can change over a period ..
your suggestion would be helpful…. Apart a general asking is can i expect always good return in long term from any of the fund or I need to review in yearly basis, but what are the parameters like peer comparion or benchmarks?? Given a choice, I will switch from BSL Manufacturing fund to HDFC balanced fund and ICICI Focused bluechip. You may have review your portfolio performance periodically. Kindly note that it is next to impossible to be with the best or STAR performers for longer period. What matters is consistency. Its ok to be in top 10 if not in top 3 best funds. Do track your overall portfolio returns, in case if any fund is not doing well, compare its returns with its fund category average returns, benchmark returns and peers returns. Do not churn your portfolio based on short term bad performance , give the funds some time and then you may decide to replace it or not. How to pick right mutual funds scheme? thanks for your inputs………. I also have RD (5000 per month – done @ 9.25%) – 4yrs gone for 10 years horizon, on 10th year I will get approx 9.30lacs . For a horizon of 10years?? 9.5% is a decent return, but kindly check what would be your real-rate of return after adjusting for taxes..
Kindly read : Why it is not advisable to invest in FDs/RDs for longer period? The mutual fund schemes mentioned here really useful for the person who are looking for financial management. Thanks for sharing this blog. I think HDFC balanced fund could be beneficial and trustworthy. My investments horizon is long of apx 20 – 25 years. this Fund is Ok are any changes in Fund. recently i am seeing Axis Nifty ETF – after open the fund i am seeting this returns aprox 850% above is it true. Dear Chiranjeevi ..Did you go through above suggested articles? You may kindly analyse the portfolio overlap and may revert to me with your analysis. Additionally for debt, I invest 1.5L every year in PPF. I still have around 10L to invest in lumpsum. Should I continue in the above funds or go for new funds. Dear sourav ..May I know your investment time-frame?? Thanks for your valuable suggestions. I want to invest 1,50,000 lump-sum amount in mutual funds for my child future. Present my child is 5 years old and I want to continue fund for 10 years. 1. Please suggest best mutual funds for 10 years period. 2. shall I invest in two or three funds or single fund is sufficient? You may consider a diversified equity fund + Mid cap fund + Balanced fund. I have started i-sip for wealth creation. I have another requirement to invest 5 to 7 lakhs lumsum for 1 year. Which fund gives atleast decent return? I expect atleast 8%, after tax. Can you suggest. Dear Ram ..Both the funds are good. For lump sum investment, you may consider an Arbitrage fund and can hold the investment for just over 12 months, as the capital gains (if any) on Arbitrage fund is tax-exempt after 12 months. Kindly read : What are Arbitrage Funds? Dear Richa ..If you are aware and ok with high risks associated with Sector/Thematic oriented funds, you may go ahead. You may check portfolio overlap among the balanced funds. 2. In case of equity, which type would you prefer: large, mid, small, diversified. 1) i am having SIP of 4000 per month in tata balanced fund from last 2 years .. since std deviation is high , do you suggest to stop the SIP and move to another fund ..I also have 5000 per month SIP in hdfc balanced , do you suggest to put the tata balanced sip also to hdfc balanced ? 2) regarding small cap fund , whats ur opiunion on reliance small cap,..i have running sip in dsp microcap and franklin smaller co.s , is investing in reliance midcap for 10 years horizon is a good option ..i think std deviation of this fund also a bit high , but returns seems to be good . 1 – As of now, you may continue with your investments in both the funds. Keep an eye on TATA bal fund’s performance this year. 2 – If you have already invested in two small cap funds, that can be sufficient, adding one more small cap may not be required. I am an epf account holder. My last contribution is 10/2016. Upto march 2017 interest added. Still how much period shall I continue my pf account with epf office. When shall I draw the money. Please inform. Dear PRABHAKAR .. Normally, an EPF accounts becomes in-operative after 3 years, during these three years, the interest is payable and gets accrued. However, during last Financial year, the central Govt has announced that interest is payable even after 3 rd year. But, EPFO is yet receive a notification on this, I guess..
Dear sir, I am your regular follower, last year I start investeing sip in hdfc balanced fund . Sir the market is on higher side I want to add one more fund (hdfc midcap) in my portfolio. Please suggest me it is the right time or I wait for sometime. Dear HARMOHAN ..It is almost impossible to TIME the markets. These things are ok, yet to be listen. But I do not see any advise or tutorials regarding GST clearly. Because, most of the writeups are in complicated terms to understand by the ordinary people. can we have>>>>>>>>>>>> THANKS. Dear SEKAR ..I have published an article on GST (Basics)..you may kindly go through it..click here.. Thanks for the suggestions on the funds. Last year I have invested in HDFC Balanced fund after reading your article and I found it is good choice. I have recently come across your blog and I find it pretty useful for personal finance planning. Thanks for creating this blog. I have a quick question not sure if this is the right platform to ask. Actually I am new to Mutual Funds but I would like to invest in some. I want to invest about 5 Lacs amount in some reliable investment with good returns. Is there any MF which can give me monthly income if I invest some lumsum amount ? Please let me know. Thanks in advance. Waiting to hear from you. Dear Manju ..Thank you for your appreciation! Suggested reading : Best Monthly Income Plans of Mutual funds. Thanks for your quick reply. I shall go through the suggested article and get back to you. Bye for now..
1)where can I approach for MFs? 2)If in banks do we have to submit form 15 for MFs ? 3)If I invest a lumsum amount say today when can I start getting monthly payouts ? 1 – You can invest online through respective MF websites / or online distribution platforms / industry sponsored online platform like MF Utility / through MF advisors. 2 – No TDS is applicable for MFs. Read : MF investments & tax implications. 3 – May I your investment objective(s) and time-frame? Thanks for your reply. Well my investment objective would be to see something similar to MIS in post office where I put some fixed amount and get monthly payouts for a stipulated period. I presume something similar can be done in MFs but not sure about the payout time frame? So, if I invest say 5 lakhs in MF as lumsum amount when can I get monthly payout and for how long ? Kindly go through this article : What are Mutual Fund MIP Plans? Nice article and I hav recently invested in HDFC balanced fund. Balanced funds are best especially when market crashes and the amount lost is less compared to other funds. Returns are pretty good especially in the longer run! May I know your other important Financial goals and their time-frames? Have you been adequately investing/saving for these goals? I am having 5 financial goals. Two Children aged 12 years & 6 years old for their education & marriage. And my retirement after 15 years. I think all are long term goals (more than 10 years) only except first child Education expenditure after 5 years. At present I am having total 30 L investments in MF. Some MF I invested are suggested by you in 2015. I am having family floater health insurance & term policy. My only liability is Housing Loan. Also this will not serve my tax benefits. Thanks in advance for your prompt reply & guidance. Based on your profile, financial goals and current investments, suggest you not to pre-pay your home loan with a lump sum amount. Instead, you may invest this corpus for your long term goals (especially for Kid’s education & your retirement). I would suggest to prepay a portion to assuage our anxieties as this would definitely be nagging the conscience now and then. A peace of mind is an intangible benefit. Also the interest burden would come down. This is really a very good article, Blogs are not just for socializing with others but it can also give us useful information like this. I really love your post, thanks for sharing this and looking forward to seeingfrom you more . L&T India Prudence NAV has increased by 16% in last 10 months, HDFC Balanced is also close to it. Thanks for the review of Balanced Funds. I am a follower of your blog from the past 6 months.your every article is very informative and trustworthy.I inspired by reading your posts.I need your advice regarding an investment strategy for my father(age 60) who is retired school teacher wants to park Rs 10 lakh at ICICI pru balanced Growth fund and starts a SWP of 10k every month from the 2nd year to fulfill the monthly expenses.Is it advisable to go ahead with this plan? May I know if he is going to be totally dependent on this income? Can he afford to take risk by investing in an equity oriented scheme? 1.No this is for additional monthly income along with the monthly pension. 2.Though it is not purely equity so if he stay invested for 10+ years will not the risk will be minimized? your advice regarding this will be highly beneficial for us. kindly respond with your valuable reply. If one invests Rs 10 Lakh assuming 10% return (on equity balanced funds), and withdraw Rs 10k per month then the accumulation can be Rs 6.5 Lakh after 10 years. If he understands the risks associated with equity funds, you may suggest him to invest in balanced fund(s) and set-up SWP. Also, any gains made after 12 months are tax-free. May I know if he has adequate Health insurance cover? By the way he has no health insurance cover. Dear Anindya.. You may suggest him to take a health cover at the earliest. Health insurance plans for Parents / Senior Citizens. You are really a wholehearted fellow.The way of your guidance is truly admirable.I wish you a good luck for ReLakhs.com. Thank you, do share the articles with your friends and kindly keep visiting ReLakhs! Hi Sreekanth, another nice article from your side. 1. As market is touching new highs every other day, do you think that it is wise to invest in equity oriented balanced funds. Balance funds invest in small/mid cap stocks as well. Don’t you think that large cap or debt oriented balance funds are better choice in today’s market scenario. My investment h0rizon is 5-10 years. 2. I have ICICI balanced fund in my portfolio. But its NAV is around 120+. Don’t you think it is wise to invest in some other balanced fund having low NAV. Suppose if i invest 1000 in a month and NAV is 100, i would be able to purchase only 10 units but if NAV is 50, i will be able to purchase 20 units. I am sorry if my question is very silly. NAV value and number of units do not matter when you are comparing 2 funds. If both the funds go up by 10%, you will have exact same notional profit in both – provided you have invested same amount in both. @Sreekanth, your inputs please for both queries. 1 – As you have long term investment horizon, advisable to invest as much as possible in Equity oriented funds. Your time-frame and investment objective(s) are more important that current market conditions. 2 – It is a misconception. Dont go by quantum of NAV. As opined by cvan..its the % of appreciation which matters. 1) both strategy is fine as long as it fullfil your asset allocation. Have said that for 5-10 year, if you can take little risk balance fund/large cap may fetch better return than debit fund post tax. I want to invest 5 lacs in hdfc balanced via STP. So i decided to invest 500k in hdfc liquid fund and choose stp of 10k every month. So the cycle will continue for 4.2years for 10k as 50 STP installments. But as i read on your blog liquid funds short term fund so is my way is correct?? Short term fund means you need the money back pretty soon (for your expenses, investment etc.). So, obviously you want to put it in something that is not so volatile, liquid, has less risk of loss, preserves capital and does not lose out to inflation too much. In my perspective, what you have done is fine. Because think of the alternatives. If you had put that into a longer term income bond fund that goes down by 5% every time there is a 1% increase in the interest rate, now suddenly you are looking at a fund of 450k to STP from rather than 500k. It will probably come back up to 500k but after a significant amount of time. On the other hand you can just keep the money in savings account and keep it safe with 4% interest only. However, now you are losing out on probably 1-2% additional income (and to inflation) that you could have got from liquid. In your case that is almost 5-10k. And liquid fund may just drop 0.2-0.3% or so (for example) for every 1% increase in interest rate. And it will very quickly recover too. Thank you cVan for sharing your insights. Agree with you. What is your opinion about canara robeco balanced fund? Dear Cvan..Have you already invested in this fund (or) planning to invest? I have invested some amount sometime back but also planning to start an SIP on it. Dear Cvan.. If you are starting fresh SIPs, may be advisable to make future investments in some other balanced fund. Thanks, will keep that in mind. I wanted to diversify a bit as the other premier balanced funds mostly invest in large caps. CR seems to have picked quite a few good small caps. Dear cvan..The fund has invested around 20% of its corpus in Debt securities, as per Valueresearch data, the debt portion falls under ‘Low’ quality and ‘high’ interest rate sensitivity block, you may have a look. Can you expand the scheme names of 2nd & 5th funds? Thanks Srikanth.This article is refreshing and timely.As market is forming new highs daily,most of the stocks and mutual funds have become expensive.Best time to invest in balance funds. Thank you Doctor Ji ! Any time is a good time to invest, based on ones Financial Goals !